This exciting exhibit of works on paper has been curated from the Zea Mays Printmaking Flat File. The work in the Flat File represents examples of prints made using green technologies. It houses over 50 portfolios of prints by member artists, including etchings, monoprints, woodcuts and linoleum prints, photo etchings and lithographs, serigraphs and mixed media prints. This show features work from the Flat File from more than 24 artists. Artists include: Judith Bowerman, Liz Chalfin, Rachel Chapman, Pamela Crawford, Sarah Creighton, Nancy Diessner, Jennifer Gover, Nancy Haver, Lyn Horan, Marsha Humphrey, Anita S. Hunt, Kate Jenkins, Julie Lapping Rivera, Doris Madsen, Tekla McInerney, Larinda Meade, Frank Ozereko, Lynn Peterfreund, Erika Radich, B.Z. Reilly, Joan Safford Wright, Joyce Silverstone, Jamie Sweeney, Janet Walerstein Winston, Carolyn Webb. An opening reception will be held on Thursday, July 7th, in conjunction with Amherst Art Walk, from 5pm to 8pm. A second Art Walk reception will follow on Thursday, August 4th, from 5pm - 8pm. Artist demos will be featured at each reception, 5-6:30pm. Lynn Peterfreund will demonstrate trace monotype on July 7th, and Erika Radich will cut wood plates as a demo on August 4th. 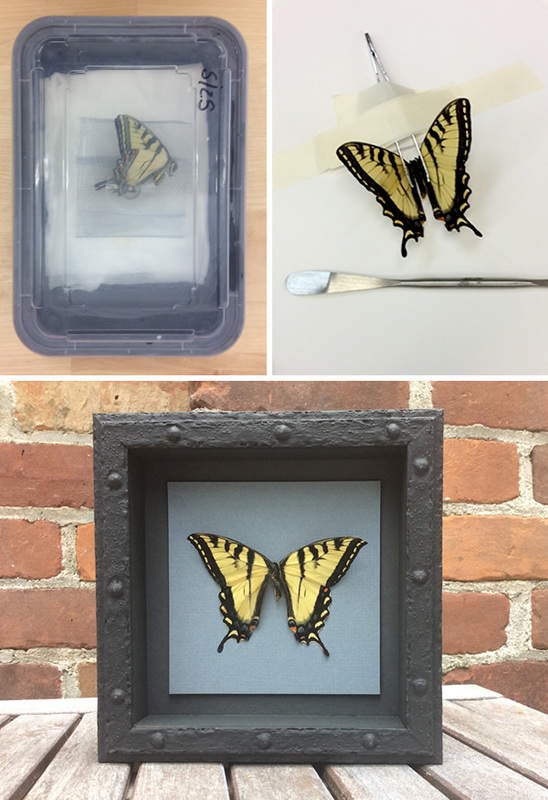 This month's framing challenge was to frame this beautiful Swallowtail butterfly. The first step was to open the wings. This required a visit to the relaxation chamber. After five days of r&r in the chamber, with damp paper towels and an anti-fungal, we were able to slowly open the wings. Our good friends Jane Thurber, Stephen Schreiber, and Sigrid Miller Pollin have a show, Field Notes 6, coming up at the UMass NYPOP Gallery in Chelsea at the end of July. If you're headed to NYC, check it out! Their Field Notes 5 show was in our gallery last March. The Field Notes shows are collaborative exhibitions of drawings, paintings, collages, and sculptures created by the three artists. Copyright © 2016 Hope & Feathers Framing, All rights reserved. You are receiving this email because you opted in at our website or signed up in our store.